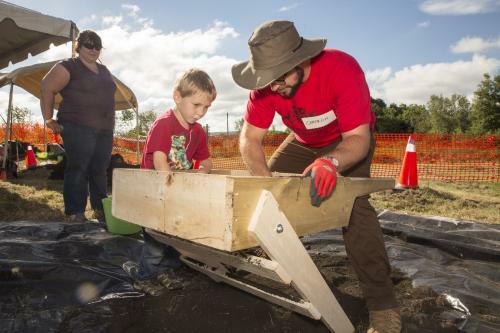 In 2016, thanks to a partnership with Industrial Heritage Nova Scotia, we resumed archaeological activity in the area of the foundry complex. With “many hands making light work” we carried out public digs over 2 days, having 110 volunteers directed by 7 volunteer archaeologists. Learn more about this dig. The best object we found in the 2016 dig was a section of fish belly rail (see Finds from the Dig – Gallery to learn more about this rail). 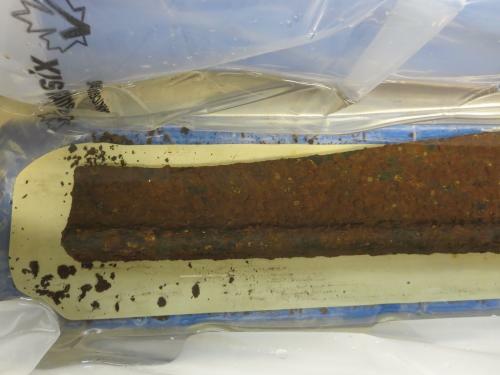 We have been gently soaking it in a bath of sodium hydroxide to remove any material not part of the cast iron. The solution is refreshed every month and the rail is photographed to document the progress of removing impurities. The fish belly rail in solution Oct. 18, 2017. We will continue to soak it until there are no more bits loosening off. Once completed, we will be able to measure the true size of the rail. This may give us clues to its origins and how it was made. Did it come from England or was it made at the Albion Mines foundry? At the artifact-cleaning workshop a volunteer dry-brushes pieces found in the 2016 dig. 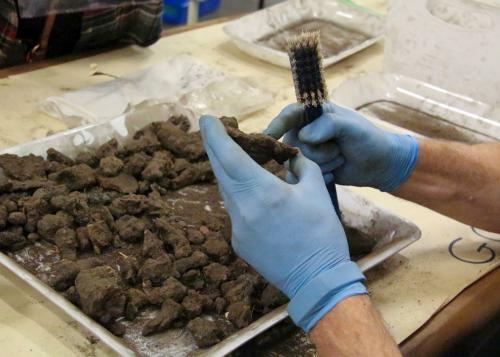 We held an artifact-cleaning workshop to dry-brush many of the fragments and objects from the dig. There are hundreds of bits of iron, slate, brick as well as unidentified pieces. Almost 40 volunteers from the community, including some of the participants from the dig, helped out to further our knowledge. 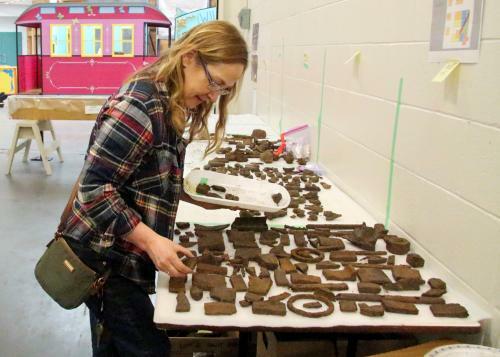 One of the volunteer archaeologists examines items cleaned by volunteers at the artifact-cleaning workshop. Once cleaned, the objects can more clearly be identified by the lead archaeologist. This will provide clues to assist the direction of our future research about the foundry.